In the case of macular holes, surgery may be necessary in many cases to improve vision. In the surgery procedure called vitrectomy, the vitreous gel is removed to prevent it from pulling on the retina and replaced with a bubble containing a mixture of air and gas. The bubble acts as an internal, temporary bandage that holds the edge of the macular hole in place as it heals. Surgery is performed under local anesthesia by our qualified eye surgeon. Floaters are tiny moving spots that appear in the field of vision. Increased number of floaters requires medical attention, as lack of immediate treatment may cause loss of vision. An eye examination with dilation will be done. Eye floaters may appear as specks, cobwebs, dots or like threads. Sudden appearance of such floaters may be the symptoms of very serious problems like retinal detachment. Other conditions that cause floaters are eye trauma; crystal deposits on vitreous, eye tumor & diabetic retinopathy. In certain cases, the eye surgeon may advice surgical procedure called vitrectomy. Diabetic retinopathy is a serious eye condition affecting the retina part of the diabetic patient’s eye. It affects the circulatory system in eye. Diabetic retinopathy is the result of damage to the tiny blood vessels that nourish the retina. Leak of blood and fluids will cause blurry vision. The condition usually affects both eyes. 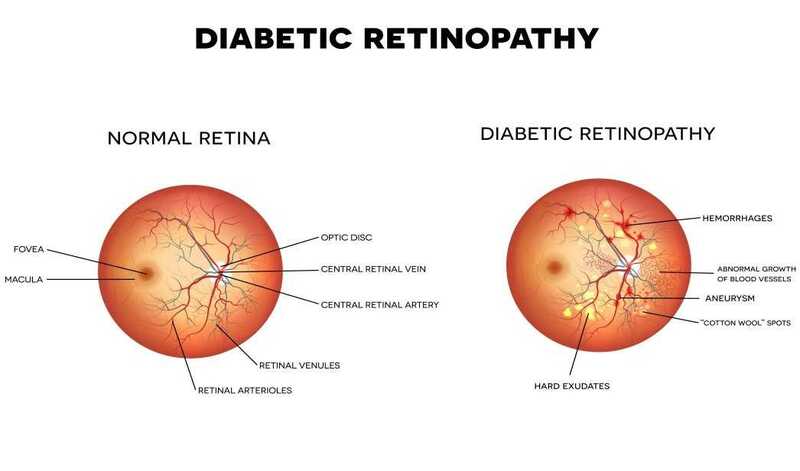 The longer a person has diabetes, the more likely they will develop diabetic retinopathy. If left untreated, diabetic retinopathy can cause blindness. Diabetic patients are advised to take up comprehensive eye examination every year. Retinal tears are first stage of retinal detachment. Family history, eye injury and severe near sightedness are few causes Symptoms may be flashes, floaters or darkened peripheral vision. Early diagnosis can prevent vision loss. Treatment options vary depending on the complexity. The options include Laser, scleral buckling procedure, vitrectomy surgery and will be advised by out retina specialist. The primary part of the eye affected by diabetes is the retina. Depending on the type, location, and extent of damage in the retina, the change in vision will range from minimal to severe and be temporary or permanent. For Diabetic retinopathy, surgical treatment may be the treatment of choice and will be decided by the consulting retina specialist. Retinal vein occlusion is a blockage in the veins returning blood flow from the retina. The retina is where images are converted to nerve signals. There is a main retinal vein as well as branch veins that supply blood and oxygen to different areas of the retina. Blockages can affect any of them and are often caused by blood clots. An occlusion can cause blood or other fluids to build up in the retina. This impairs the retina’s ability to filter light. A sudden loss of vision can occur. The severity will depend on which vein is blocked. Macular degeneration is caused by deterioration of the retina and can severely impair vision. There is no cure for macular degeneration, but it can be treated with vitamins, laser therapy, medications, and vision aids. This is a common condition in people over 60 years and is often asymptomatic. 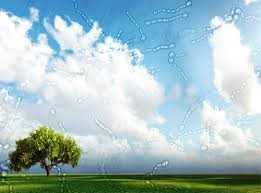 Macular degeneration is categorized as wet and dry macular degeneration. Dry macular degeneration has less effect on vision. In this case macula undergoes atrophy and waste material called ‘drusen’ gets deposited and can be treated with vitamins. Vitamins are to be taken only after consulting doctor to avoid side effects. 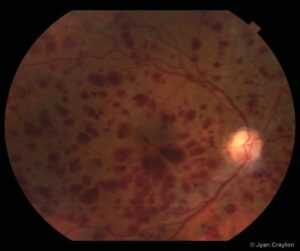 Wet macular degeneration aids in tiny blood vessel growth causing leakage of blood and fluid. This is less common condition but causes serious effect in the vision. Intravitreal injections help in halting the progression & even reversing the vision. Photodynamic therapy is another treatment option available at our eye clinic. This involves Laser to seal the leaking blood vessels. In this case, cellophane like thin membrane forms on the surface of macula. 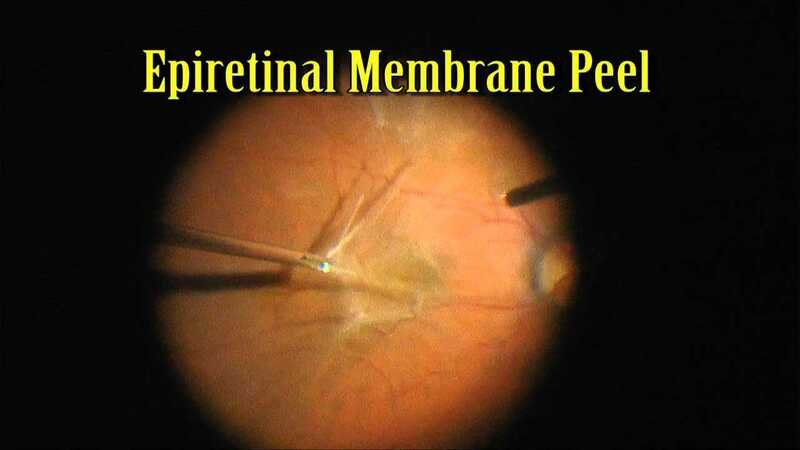 The membrane may be a result of previous retinal detachment. The condition can be diagnosed by dilated eye examination. In these cases, no treatment will be necessary, although periodic follow-up exams may be recommended. Occasionally, however, the membrane may slowly grow and thicken over time, causing a wrinkling and swelling of the underlying macula. This might cause distortion and blurring of the vision. This is sometimes referred to as a macular pucker. When this occurs, surgery may be required to peel the membrane from the surface of the macula in order to allow it to smoothen out. 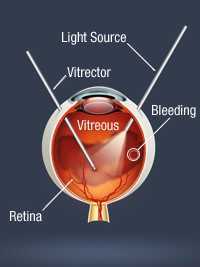 The surgery procedure called vitrectomy may be used.